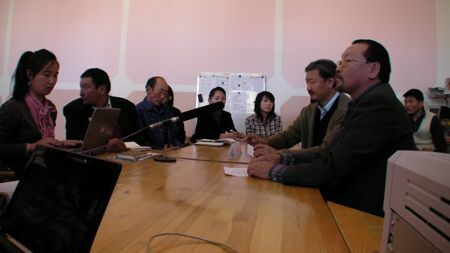 Every Saturday in the new downtown offices of the Nomad Green project in Ulaanbaatar, Mongolia, the citizen journalists gather to learn new skills to apply to their blogging work. New participants also gather to learn about the project and learn how to get started adding their voices to the Nomad Green website. An added component to these Saturday workshops is the presence of a local community leader who accepted the project's invitation to be interviewed by the citizen journalists and participate in a roundtable discussion. The first guest for this series of interviews was the former Finance Minister of Mongolia, Y. Ochirsukh, and whose visit was documented by Byambatuvshin [mn]. On Saturday, October 16, N. Algaa, the Executive Director of the Mongolian National Mining Association was the special guest and took part in a small roundtable discussion about the balance between promoting the mining industry and protecting the environment. 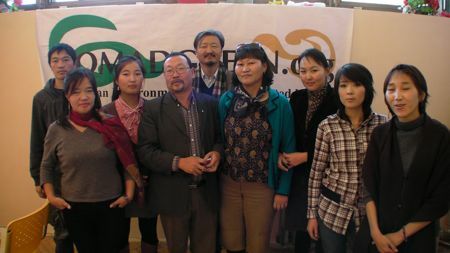 He admitted that his responsibility lies with working with the various mining operations in the country, but invited Nomad Green to work with them to raise awareness about the environmental issues, since he readily admitted that Mongolia faces serious environmental issues such as desertification. Algaa added that the mining industry employs many Mongolians, and which is vital in providing an economic benefit in a country where many live below the poverty line. However, many of the citizen journalists were skeptical and believed that the National Mining Association could do even more based on its stature within the mining community. They added that rehabilitation is not enough, but that there should be proactive strategies to protect the environment while recognizing that mining does play an important role in Mongolia's economy. Nomad Green citizen journalists with N. Algaa following the roundtable discussion. The dialogue was cordial and constructive, and many of the Nomad Green citizen journalists continued to chat with Algaa after the formal roundtable concluded.